I hope you are having a great day. 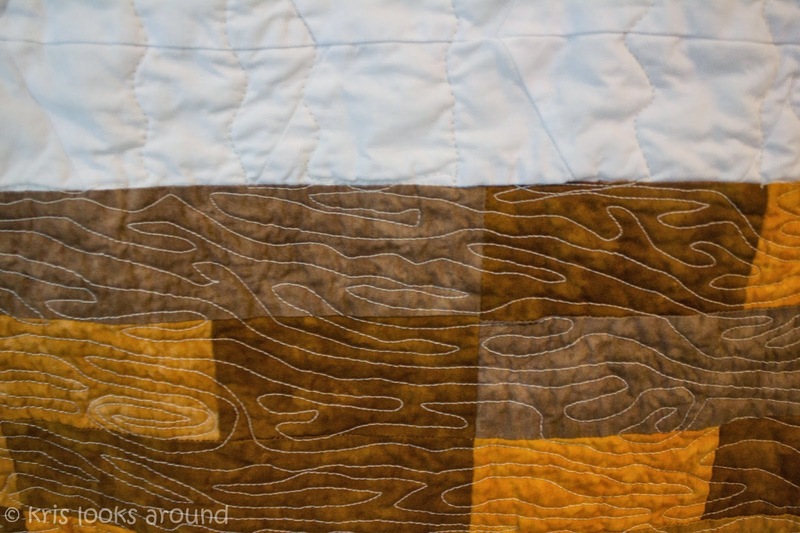 My name is Kris from krisrunner.wordpress.com and I am pleased to share this quilt with you today. At my house, the daffodils are blooming and the tulips are just around the corner. 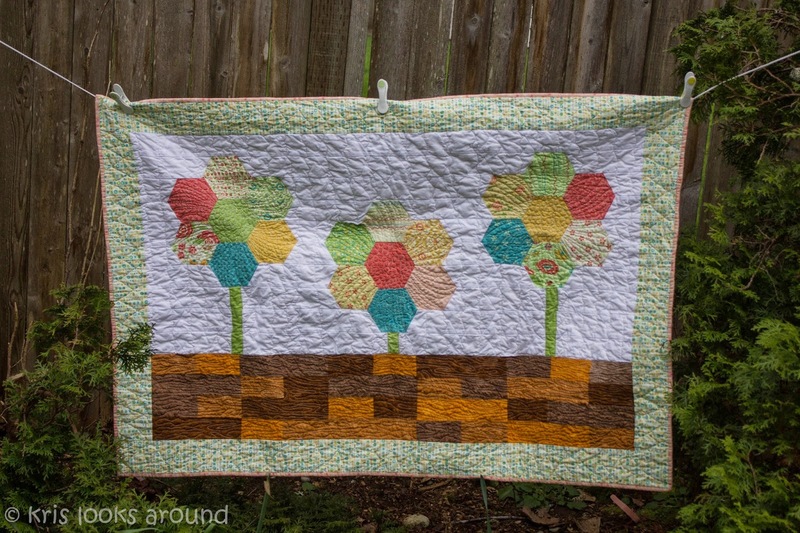 I wanted to make a flower quilt using a hexi design – and that is how this quilt came to be. 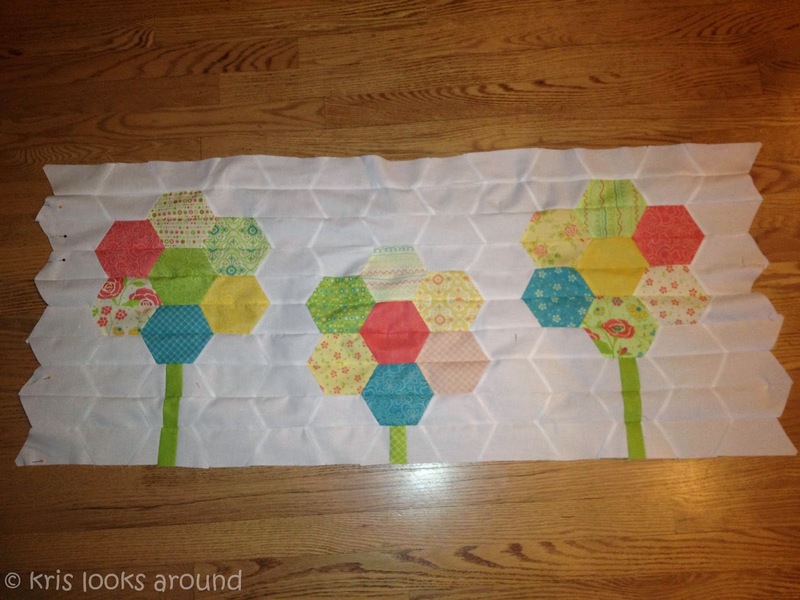 I was surprised at how easy it was to use a half hexi template to make this quilt. 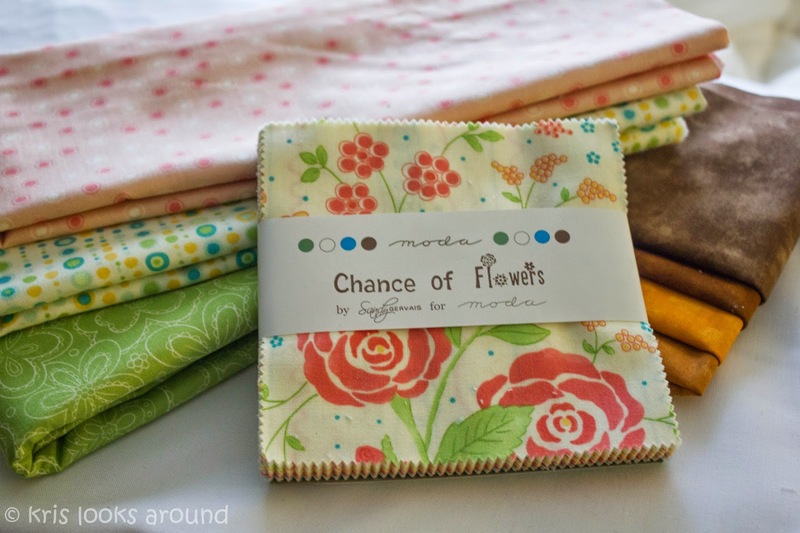 I loved the colors in Chance of Flowers by Sandy Gervais and hope the great colors brighten your day as you make this quilt. 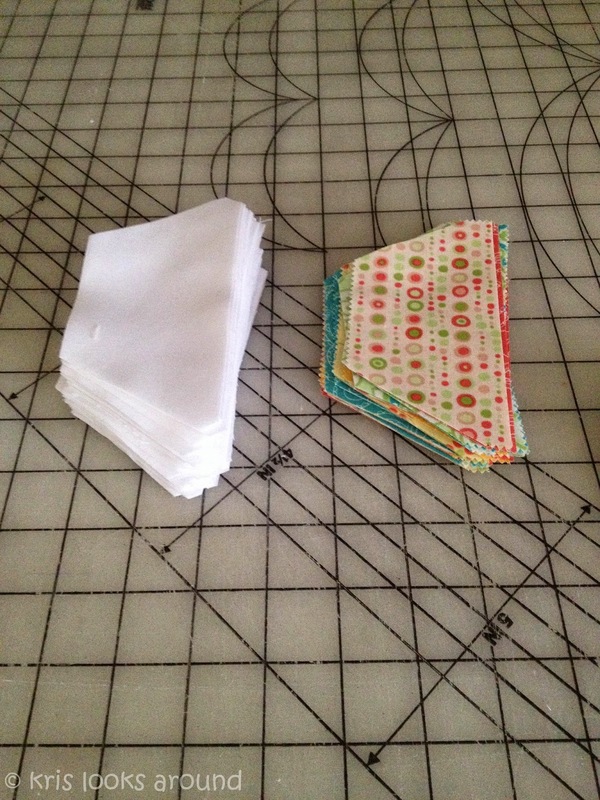 This makes it easy to use with a charm pack or with jelly roll left overs or as a stash buster. ** All sewing will be done with a 1/4 inch seam. 1. Sort your charm pack into a couple of different piles. Pick two green charms to be your stems of your flowers. Finally, create 3 sets of 6 charms to be the outsides of your flowers. 3. 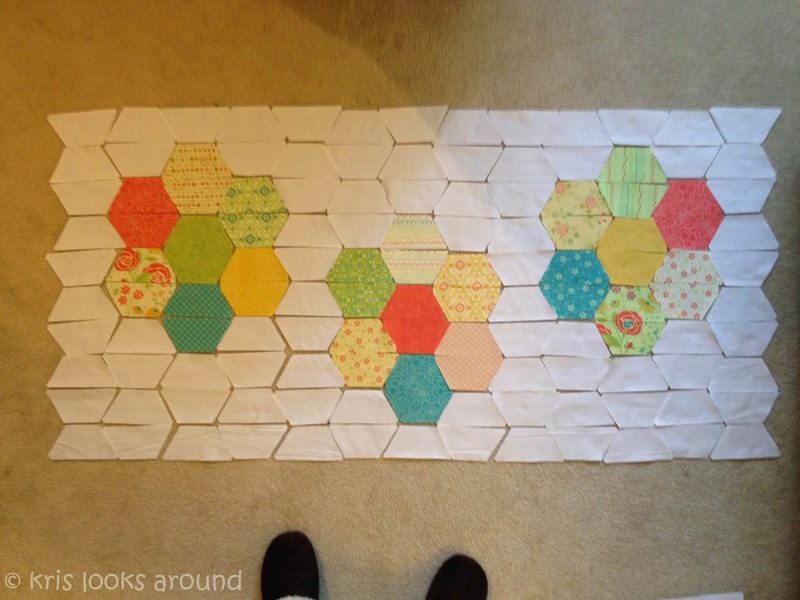 Use your half hexi template and cut the 42 rectangles into half hexis. 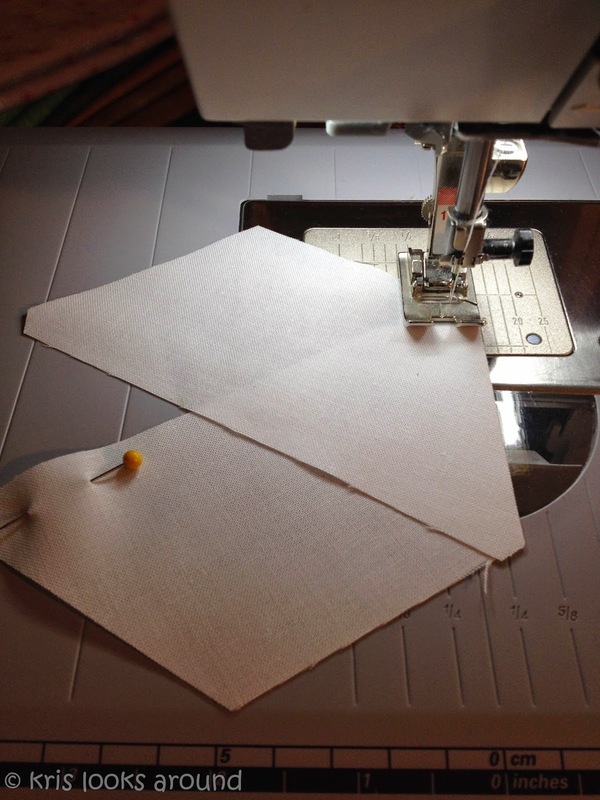 Make sure to cut the notches on the ends – this will help when you line them up to sew. 4. Next you will want to cut 9 strips of 2.5″x WOF from the Bella Solid Snow material. 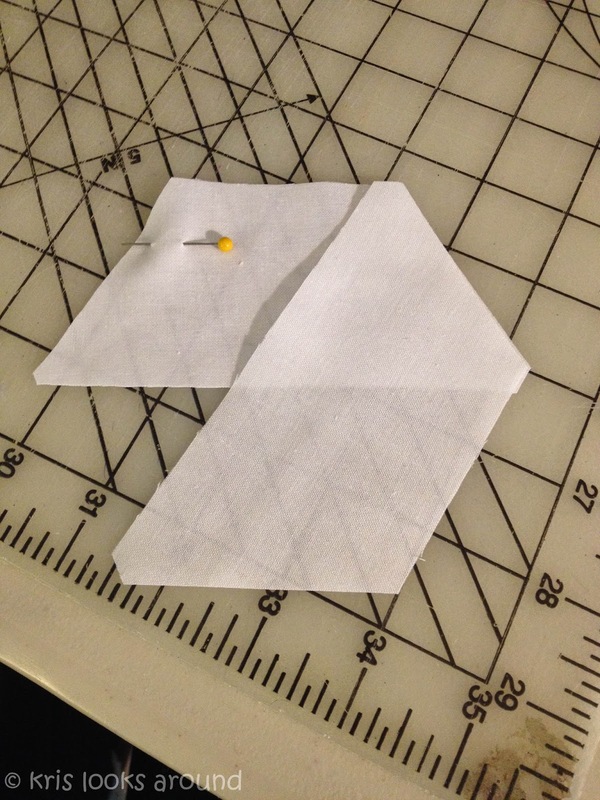 Using your half hexi template, cut 88 white half hexis. 5. 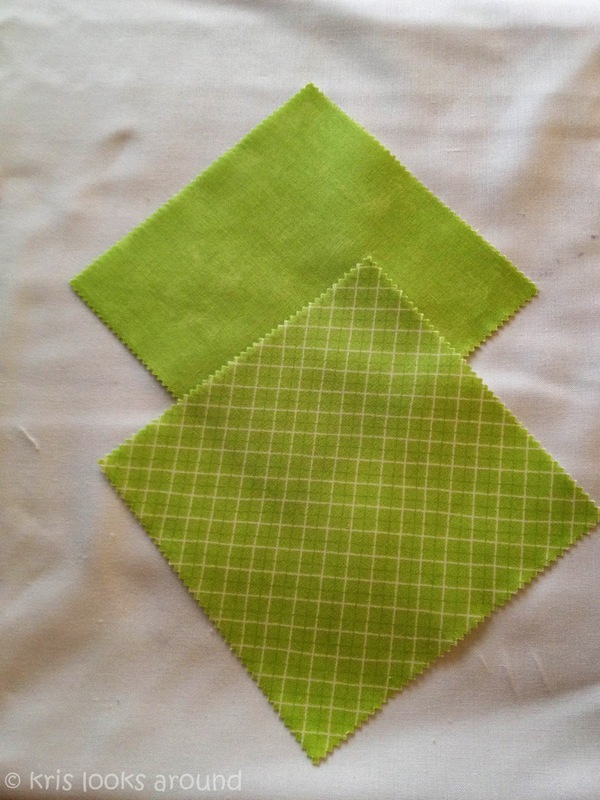 Take the green charms for your stems and cut 7 rectangles as 1.5″ x 2.5″ stem pieces. 6. Next you are going to want to lay out your flowers. 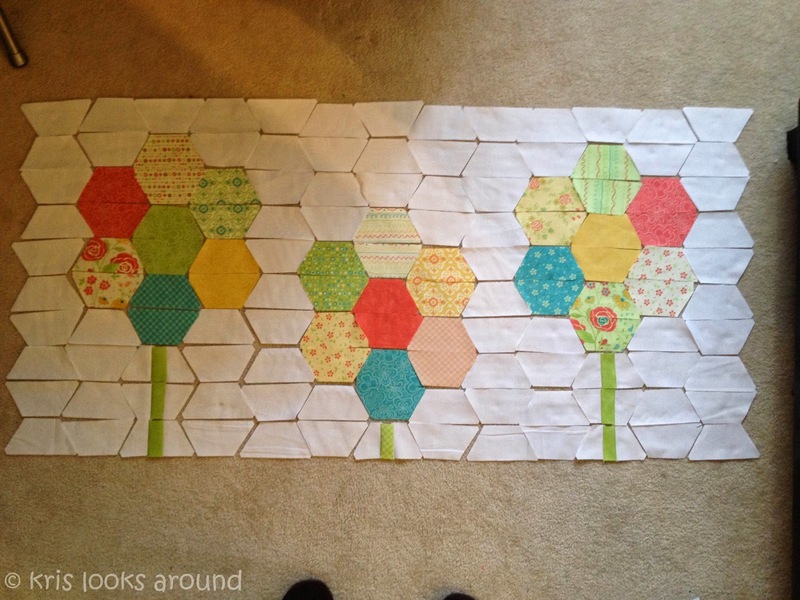 To do this you will want to start with one of your center half hexis and pair it with the matching half hexi. Then, add 6 additional pairs of hexis to complete the flower. Continue this with the remaining two flowers and connect them with white as shown in the picture below. Place the middle flower a hexi lower that than ones on the two sides. 7. Once you have your flowers like you want, fill in with the rest of the white hexis. Place a row of white on the top and on the bottom and on each end of the flowers like in the picture below. The ends will be jagged and that is correct. We will trim them later. 8. We are going to now sew the stems on to the white hexi’s. Take the seven half hexis under the flowers for your stems. 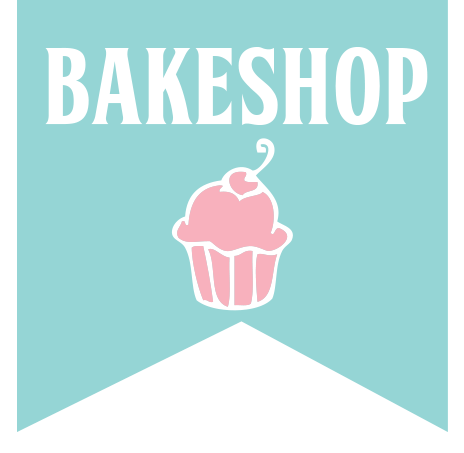 With each one, cut off 1″ from the top left edge. Cut 1/2 inch off the other side. 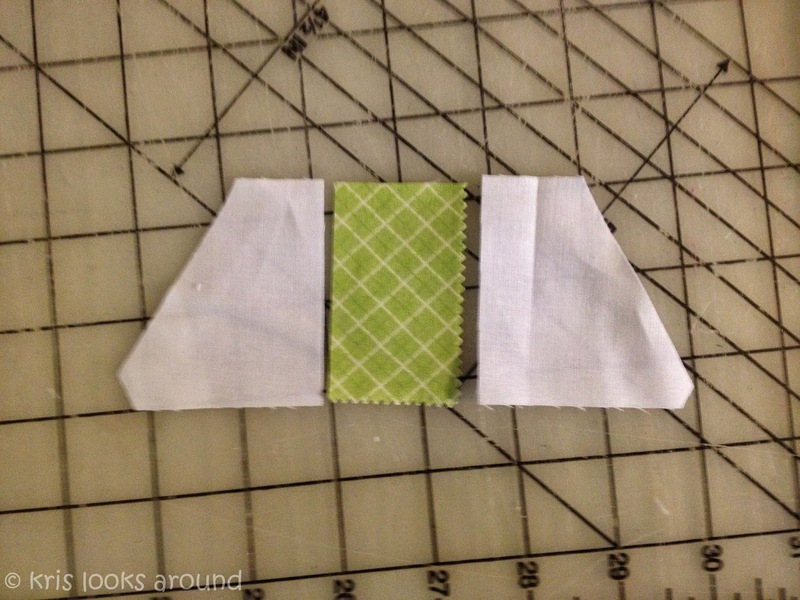 Insert the stem piece (2.5″ x1.5″ green) using 1/4 inch seams between each side of the half hexi, Press your seams as you go. Do this for the remaining 6 stem pieces. When you have completed this place the stem half hexis back onto your flower layout. 9. Now that you have your layout complete (congratulations!) 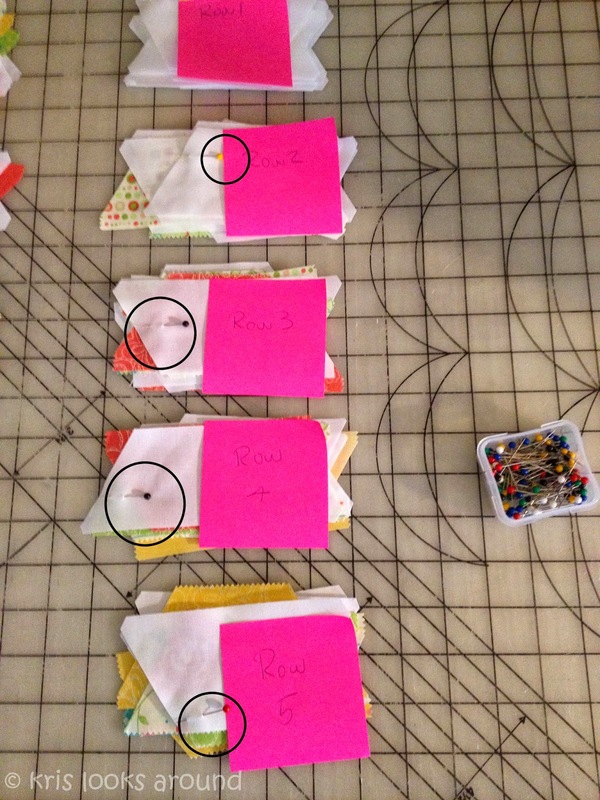 Let’s talk about how to get ready to sew the rows. If you have a preferred approach, use that. I’m going to describe the approach that I’ve settled on for this type of quilt. 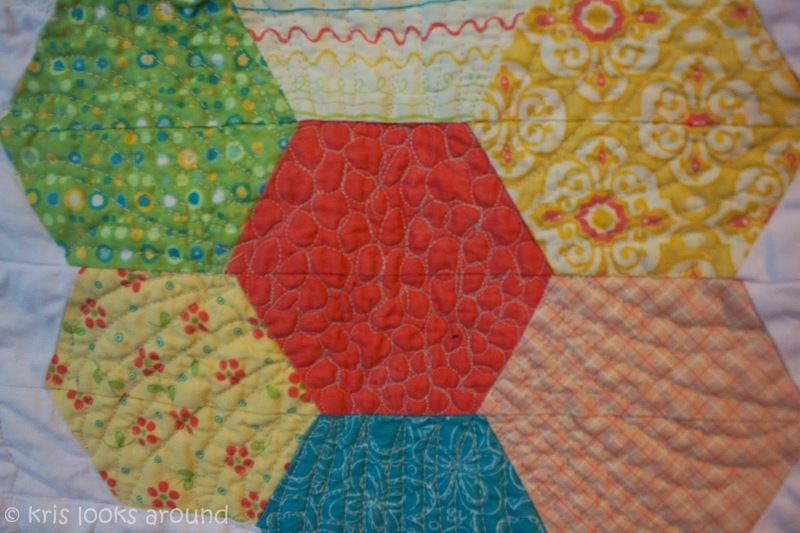 Moving from left to right, take the first hexi and place it on top of the next hexi. 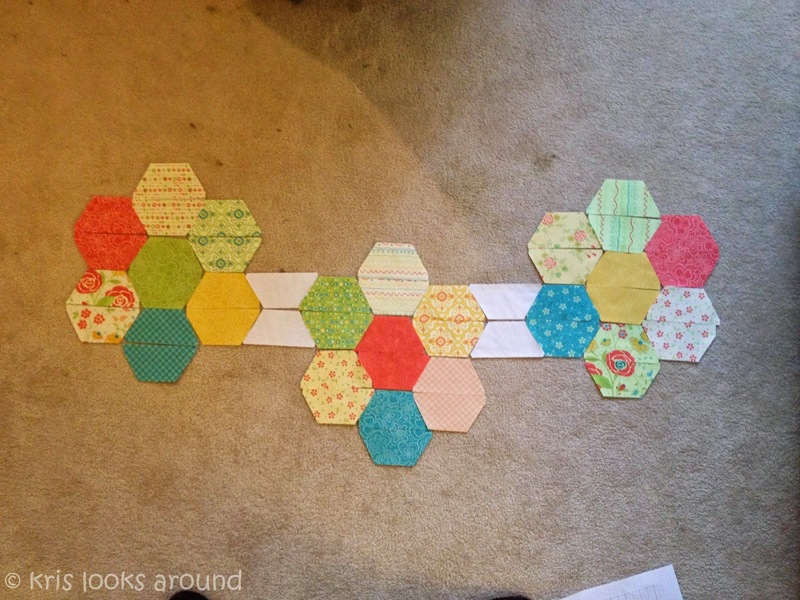 Making sure that you always place the next hexi on the bottom of your pile. You will end up with 10 rows of 13 hexis. The top hexi is the left most piece. 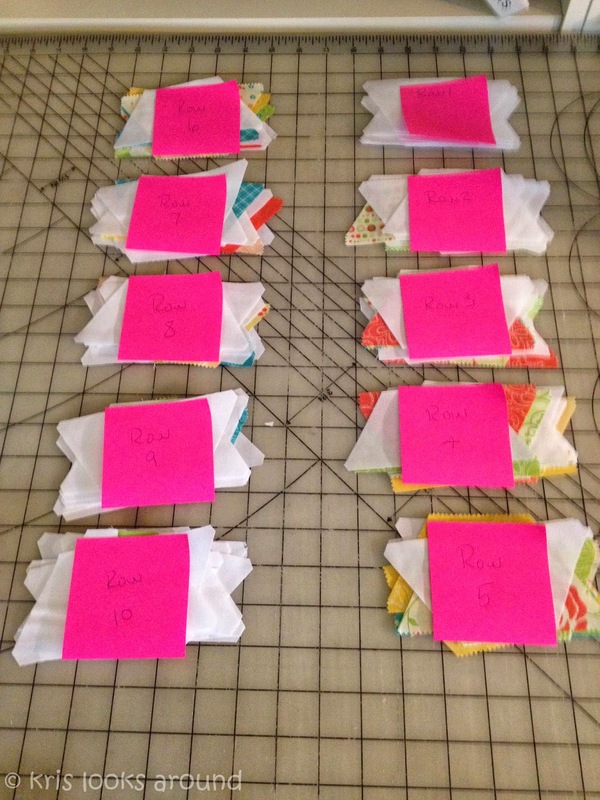 I label each row with a sticky note so that I can keep the rows in the correct order. I chain piece 5 rows at a time. I have found that keeping track of the row I am on and which is the left hand edge piece can be tough. 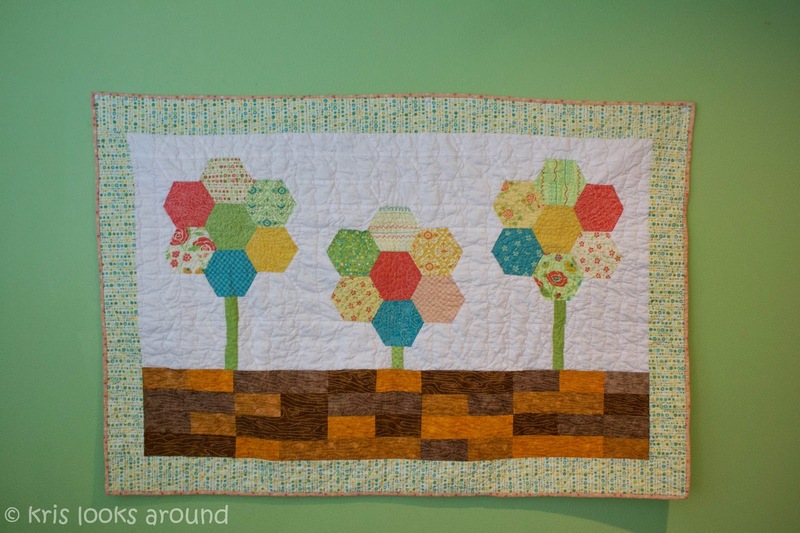 My trick is to put a straight pin in the left hexi of each row. The vertical placement of the pin indicates row # (the highest pin is row #1). I have circled the pins in the photo below so you can see my trick. 10. 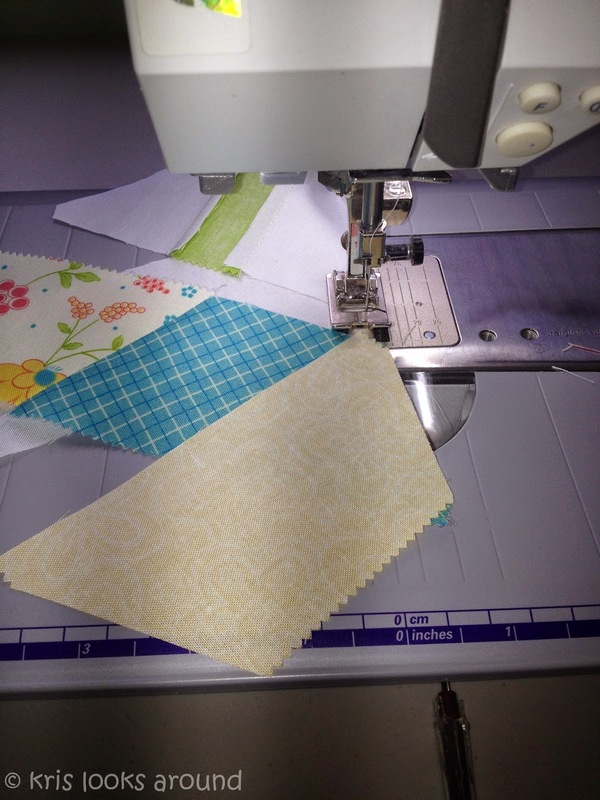 You are ready to start sewing your rows. See the picture below to see how to line up your hexis. 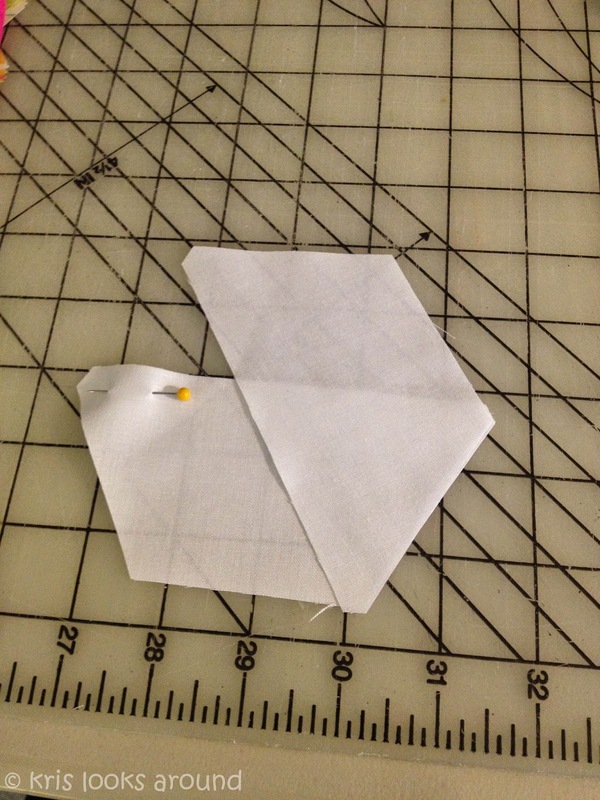 Make sure to press your seams after each hexi. 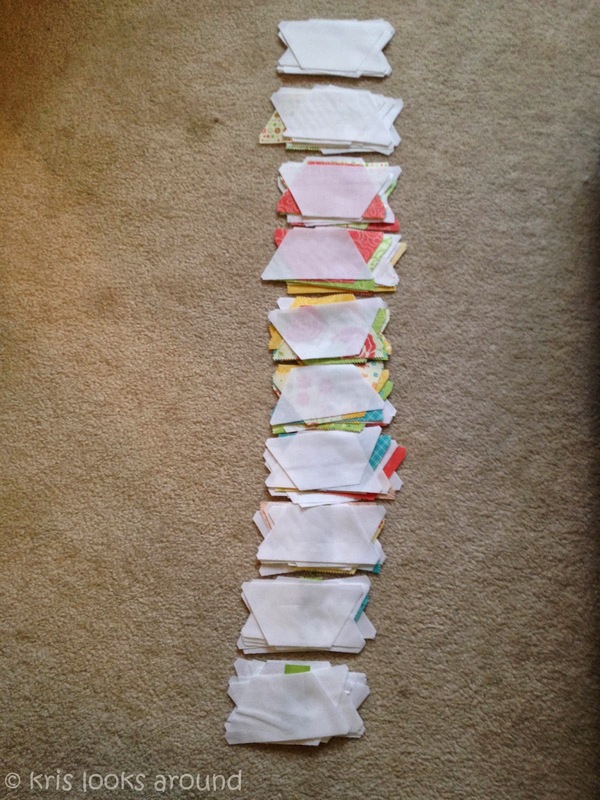 You will sew the hexis together until you have sewn all 13 hexis together. This is a picture of that it will look like as you are sewing part way along the row. 11. 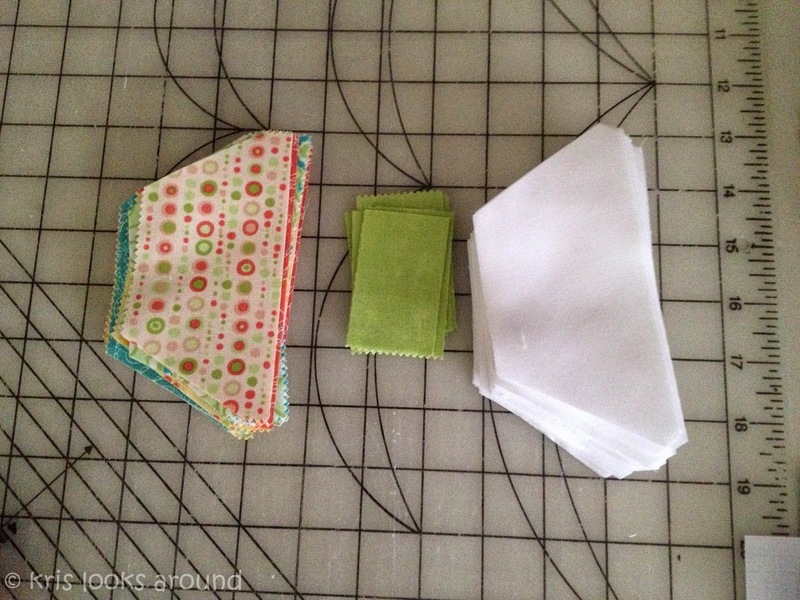 Once you have sewn all your rows together, lay it back out and admire your work! You are amazing! Feel free to enjoy a cold or hot beverage of your choosing at this point. Now you will sew all your rows together. Pressing your seams as you go. Don’t you love it! 12. 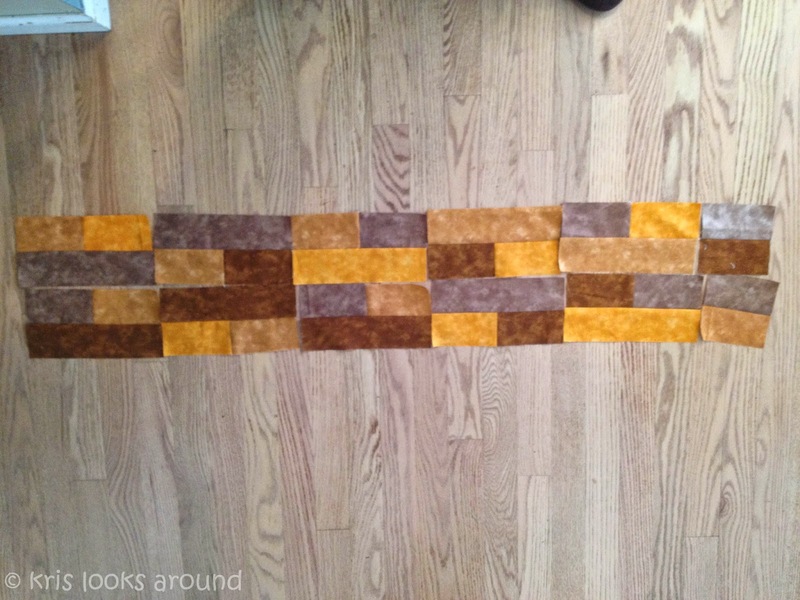 Now that the rows are all sewn together you will want to trim the edges. 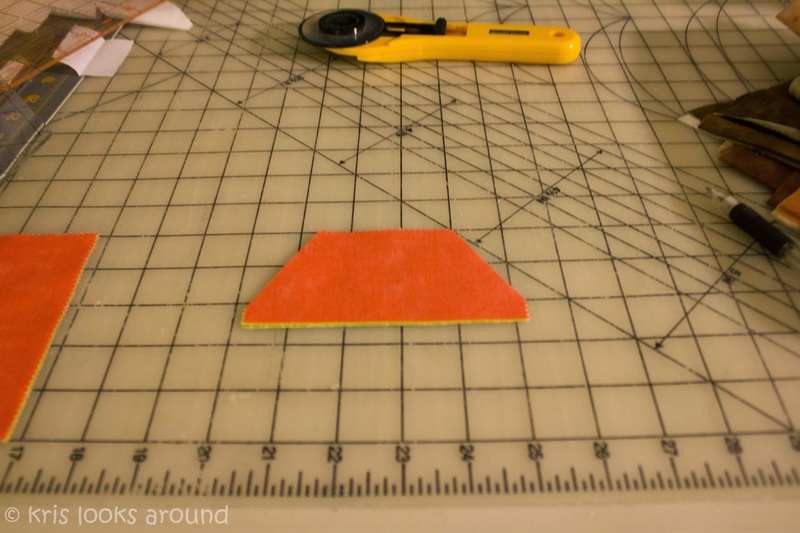 Use a ruler and trim off the edge to form a straight edge. 13. Next step is to create your window box. I loved using different browns to make more of weathered look to the window box. 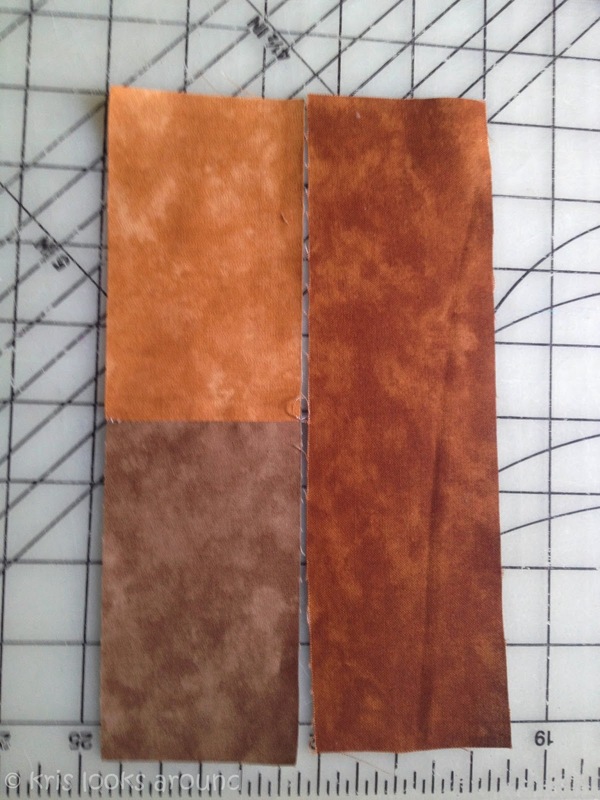 If you don’t want the same weathered look, feel free to just use one piece of brown material (8.5″x 44.5″). 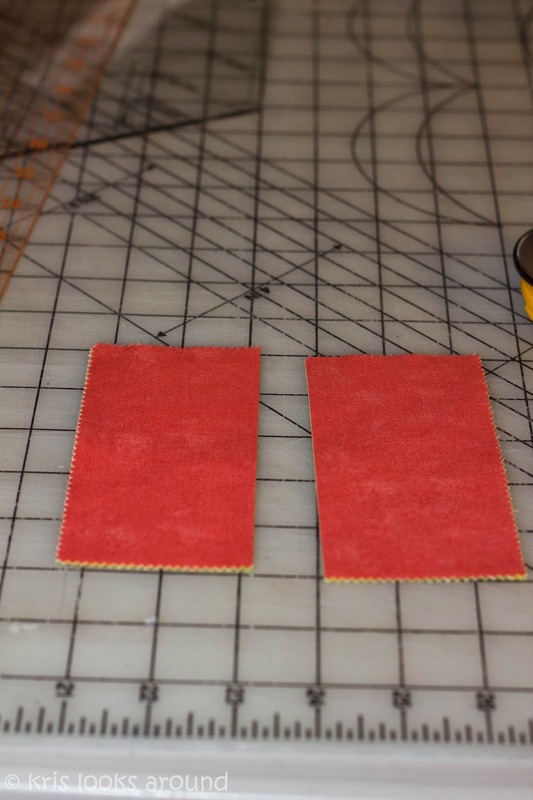 Hold aside 4 of your 2.5″ x 4.5″ rectangles (one of each color) for later. 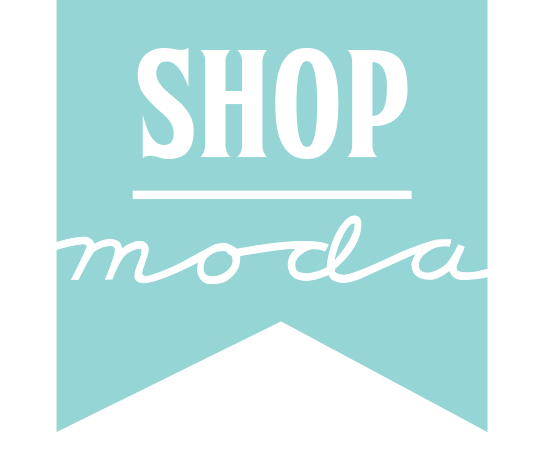 Select different color combinations from the smaller rectangles and sew them together giving you 10 rectangles of 2.5″ x 8.5″. Combine each 2.5″x 8.5″ mixed color rectangle with a solid 2.5″ x 8.5″ rectangle resulting in 10 larger 4.5″ x 8.5″ rectangles. 14. Sew the flowers to the window block making sure that the window box is adjoining the flower stems. Cut 2 rectangles 30″ x 3.5″. 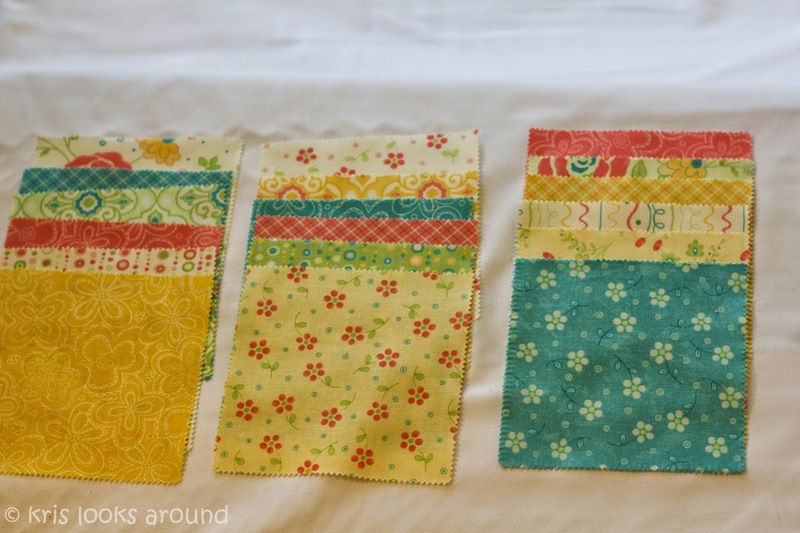 Using the extra from those WOF you will sew them on to your 2 strips of 3.5″ x WOF to create 2 rectangles which are 51″ x 3.5″. Sew the 30″ x 3.5″ strips to the ends of your flower and window box. 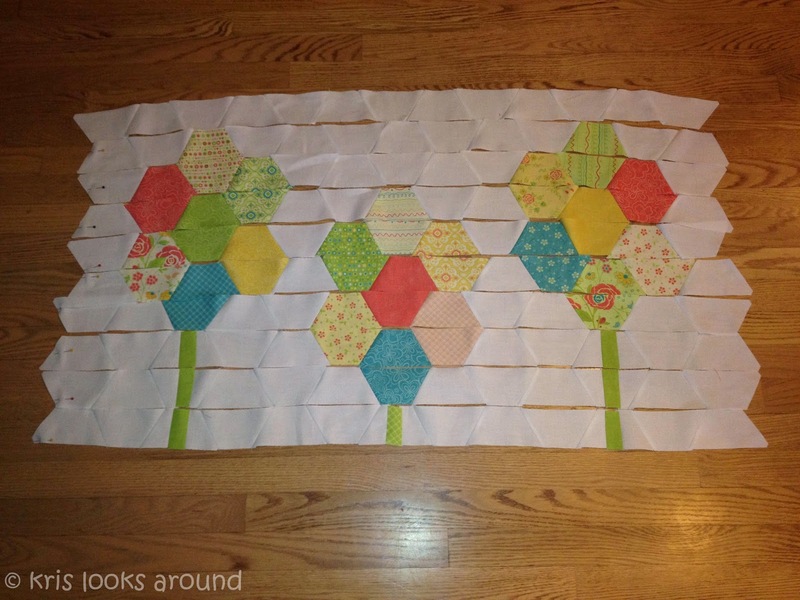 Sew the 51″x 3.5″ strips to the top and bottom of the your flower and window box. 16. 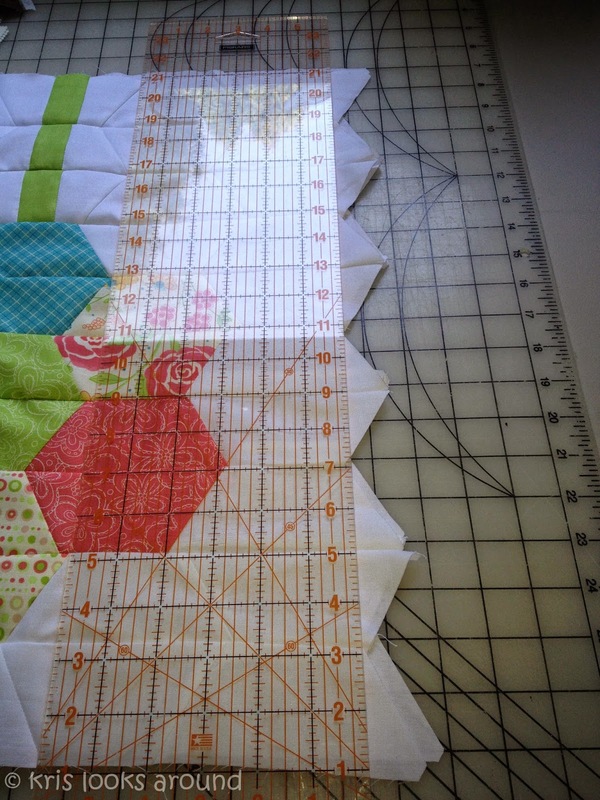 Add batting and backing to your quilt top and start adding texture. Have fun! I chose to quilt pebbles in the centers of the flowers and swoops in the outside flowers. I tried to create wood grain on the window box. 17. 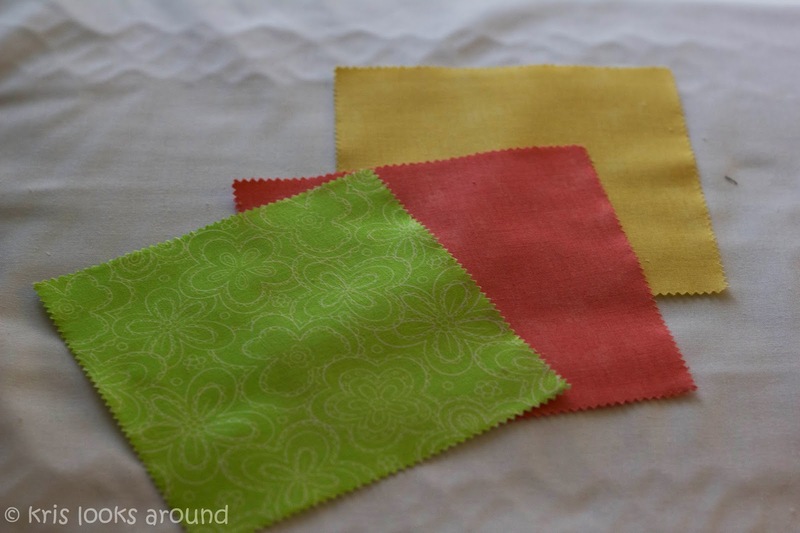 Bind your quilt and then wash it to get all the crinkly goodness of a quilt. …into my sewing room wall. You could make a bed runner by adding a couple more flowers to each side if you wanted to expand it.